Just create a backup of your iPhone's contents with Apple iTunes, but have no idea about where the iTunes backup file is located? If you want to access and view the iTunes backup files, then look no further. We will walk you through the process to view iTunes backup files in the specific directory. The tricks work for both Windows and Mac OS X. 1. The Application Data/AppData is a hidden folder in Windows. So you must turn on "Show hidden files and folders" option in Windows to see that folder. 2. The "~" represents your home directory of Mac OS. If you don't see Library in your Home folder, hold Option and click the Go menu. Apple offers good backup and restoration service for the data on your iOS devices although, it does not grant you full access to check out the actual contents of the backups you may create using iTunes. Finding the backup file doesn't mean you've really got it. In order to protect personal privacy, iTunes backup is a kind of SQLITEDB file, which doesn't allow anyone to access or preview. You only can restore the whole content to your device, single SMS or contacts not permitted. If you want to access iTunes backup files like contacts, text messages, SMS, videos, photos, calendar, voice memos, etc, you need help with third-party software. 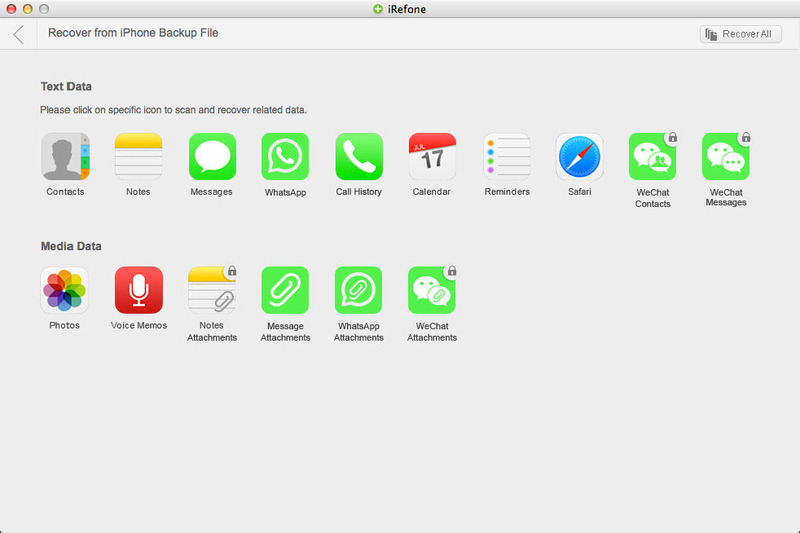 Here iRefone for Mac is highly recommended as the best iPhone backup viewer. It allows you to preview and even extract 13+ different types of files from iTunes backup, to download iCloud backup and to extract what you want from iCloud backup. 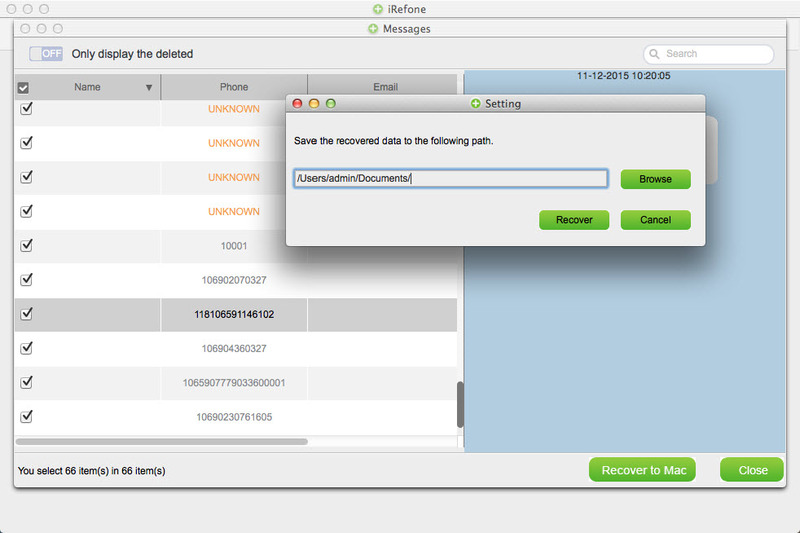 Of course, it is more than one iPhone backup viewer and extractor, you can also use it to recover your iPhone/iPad/iPod Touch data, such as contacts, call history, SMS messages, safari history, photos, voice memo, WeChat messages and so on. This program can be run both on Windows and Mac OS X. If you want to extract iTunes backup files on Windows PC, please turn to iRefone. 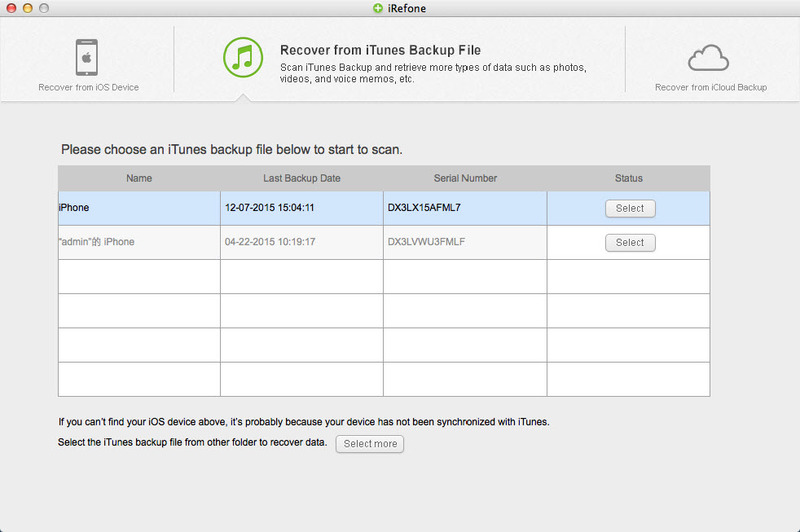 Now follow the steps below to access iTunes backup and recover the item if you want. Run iRefone. The program will list all iTunes backup files existing on the computer. Choose the iPhone backup file you want to access. After you have selected the iTunes backup file, you need to select the certain data item like contacts, text messages, SMS, videos, photos, calendar, voice memos... you want to recover, or you can check "Recover All" to recover all the data that iRefone supports. After scanning, you can view the details of iPhone backup content and you may do some modifications to your Contacts, Notes, and Reminders, etc. Then click "Recover to Mac" to save them on your computer.